To finish the Global Tourism unit students explored the future of the industry by discussing how sustainable the growth is. 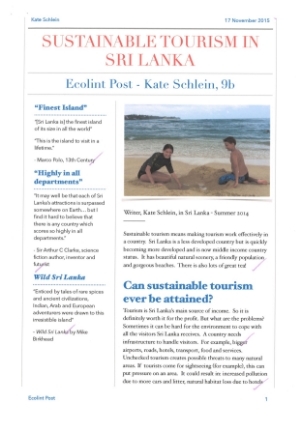 The students chose a sustainable tourism project to critique. The were asked to give a background of the project, a cost-benefit analysis of the results of the scheme and whether it should continue. The group then produced a newspaper report of their findings.